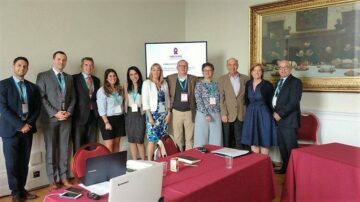 I joined the first formal Board meeting for Pancreatic Cancer Europe (since its new legal status as a not-for profit registered in Brussels) which was held in Liverpool in early July. I have been a founder member of Pancreatic Cancer Europe (PCE) which is a multi-stakeholder platform made up of clinicians, patient groups, researchers, industry, journalists and EU policy makers. Our aim is to improve diagnosis and care for patients across the EU and to ensure that there are no inequalities in that care no matter where patients reside. There are four main work streams: Awareness and Diagnosis, Registries, National Support and Research and I am proud to be the lead for the Awareness work and being able to bring some of the knowledge and experience of my work with Pancreatic Cancer Action to PCE. Funded by pharmaceutical companies Celgene and Shire, we have been in operation since November 2014 and have already produced several documents and awareness materials including a micro site, symptoms posters, 10 key facts and GP leaflets on diagnosing pancreatic cancer. Thankfully, PCE covers a geographical Europe and not a political one so, being from the UK, my role as a Board member is currently unaffected by the Brexit decision. Having a legal entity for the organisation is an important step for PCE as it gives it a formal structure and increased credibility and legitimacy within the EU. This foundation will underpin the four work streams (Awareness and Diagnosis, Registries, National Support and Research) and will enable us to apply for funding from a wider group of sponsors than present. It will also enable funding from the EU itself for future projects – all with the aim of improving outcomes for pancreatic cancer patients across the EU and the UK!